The late Baba Santosh Puri was the founder of the Santosh Puri Ashram and still lives as an example to many. Babaji Guruji was a renunciate made by destiny, as in his early childhood the divine will took away through death his father, mother, seven brothers, one sister, as well as land and cows in the holy area of Lord Ram's birthplace, Ayodhya. As fortold by an Astrologer he started his fakir life as a chilld, initiated by a Sita Ram Guru. 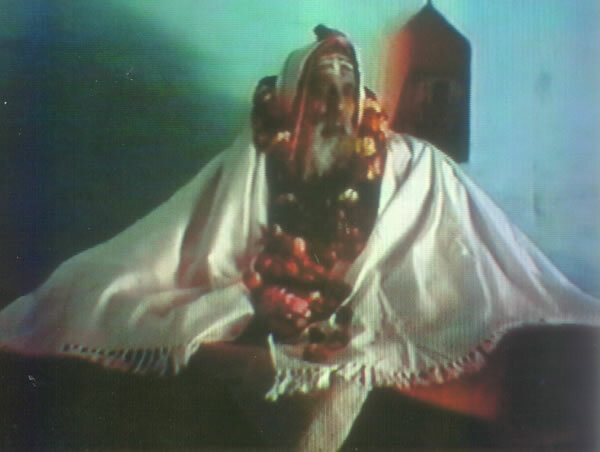 He took Sanyasa in his youth and finally was initiated at the Kumbha Mela 1974 as a Naga Baba (Avaduta) of the Sri Panch Juna Akhara by his Guru StanPati Bairav Puriji Maharaj. After severe tapas (asceticism) on an island in the Ganga in Haridwar, renouncing food and sleep, ever in service to cows and all sentient beings, the holy Ganga Goddess appeared in front of him, offering him all possible wealth, which he refused, asking for her presence only and a wealth that nobody could take away, to continue his service to the Dharma. Guruji's name was "Santosh", which means "selfsufficiency", "contentment" as a means to liberation, and that was what he really taught through his own behaviour, showing full faith in the divine will by being content with whatever might happen. 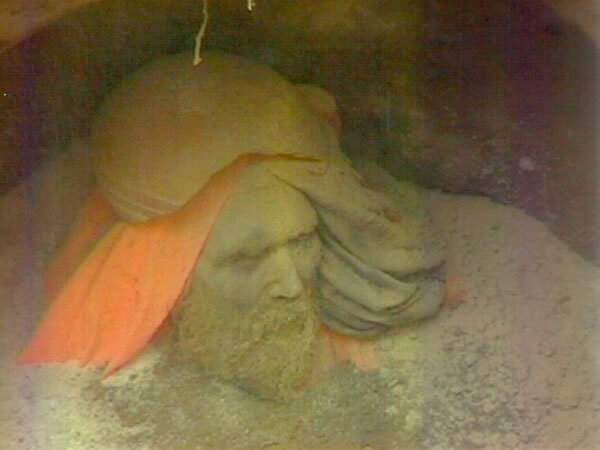 Baba Santosh Puri married Maa Narvada, a lady of German origin. Marrying is unusual but not impossible for a Saddhu. As a renunciate Baba Santosh Puri was always fighting against the Maya (world, illusion), in which form his female disciple as well appeared. But their spiritual relationship was too strong, he could not make her abandon him and his teachings and therefore after eight years a marriage took place, not for enjoyment, but out of the unshakable confidence into the divine will or the will of the holy Ganga Maata. More can be read about that on the Maa Narmada page. Even before the birth of the first son, the Santosh Puri Ashram was founded, where spiritual and charitable service life continued. 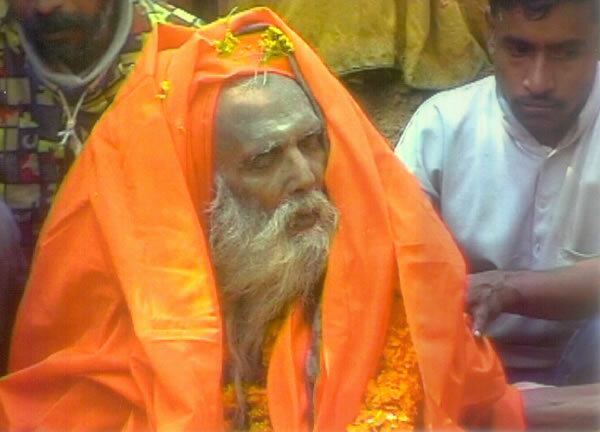 Into the auspicious time in the great Kumbh Mela in Allahabad 2001 Baba Santosh Puri left his body in Mahasamadhi as his Guruji 12 years back at the age of 108 years. Samadhi is called the conscious state of mind, when the Saint in a meditation position leaves his body and the realized immortal soul reunites with the supreme soul. 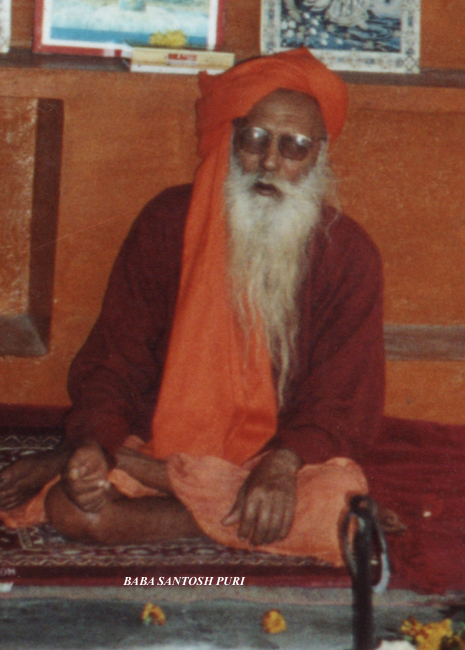 In the full moon night of January/February 2001 Guruji left his body in padma asana, pronouncing the holy sound AUM. In the sitting position he was bathed and clothed by Saints of the Akhara (root monastery) according to the ancient rituals of the Veda, and carried in a lightful procession to the bank of the river Ganga, and returned to the Ashram to be placed in the cave like samadhi ground. Maa Narvada and the children as well as the closer members of the Ashram continue life in the bliss of Guruji's benediction. 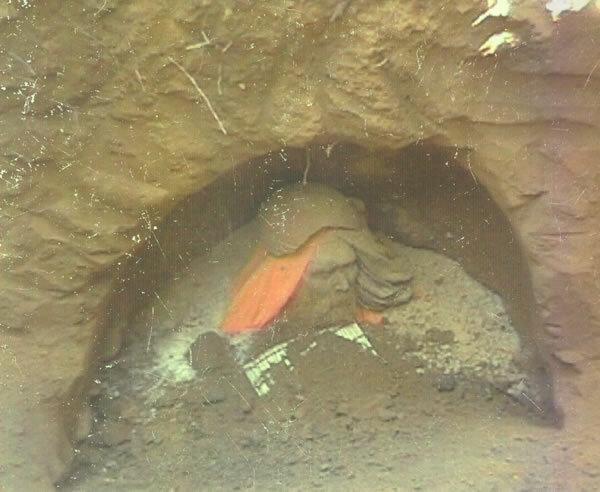 Babaji had foretold days before his samadhi, to build his "Samadhi" outside the Ashram in the garden and to construct a small Shiva temple above, through which worship they always would be protected. More can be read on the Samadhi Temple Construction page. Also see more pictures of Baba at the Santoshpuri picture gallery.